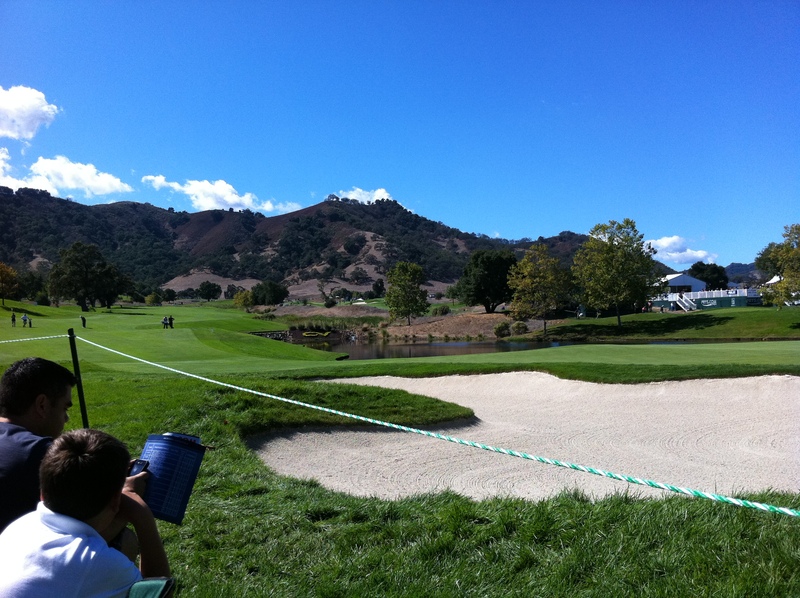 Last Friday, LG had an opportunity to visit the Frys.com Open for its second round. 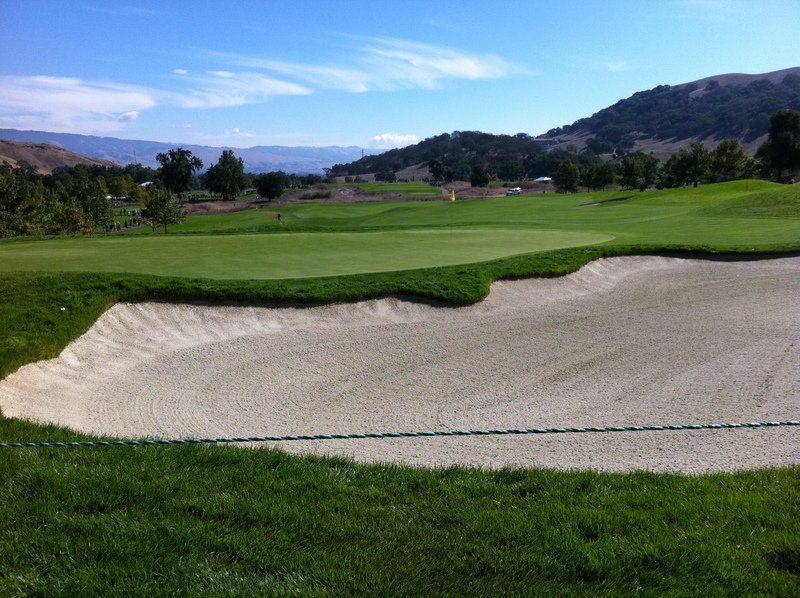 The Frys.com Open, this year, is being played at Cordevalle in San Martin, CA just south of San Jose. I mention this because, during my time walking around the course, I heard rumblings that another local course, The Institute, was in the running to take the tournament. In either case, the tournament was, and will continue to be, a nice respite from work. I could attempt to do a review of the course from just walking it, but watching some of the best players in the world essentially make a mockery of this top 100 beauty in pristine conditions would probably not be in keeping with our prior reviews. I must say, after watching these players play, the game (and course) looked much easier than I would have expected. I’m sure the course would be happy to dissuade me of this notion. 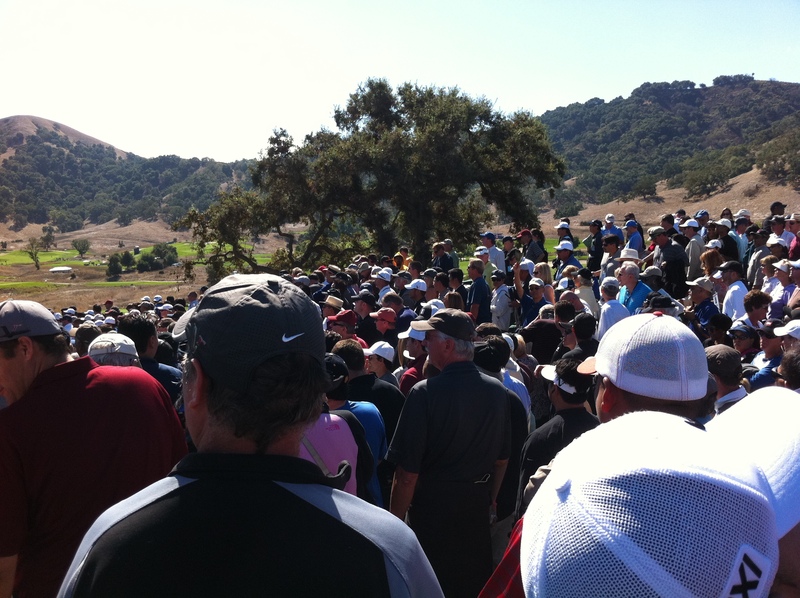 I arrived at Cordevalle at 6:40 am, admittedly to be one of the many gawkers in Tiger’s 7:40 am gallery. 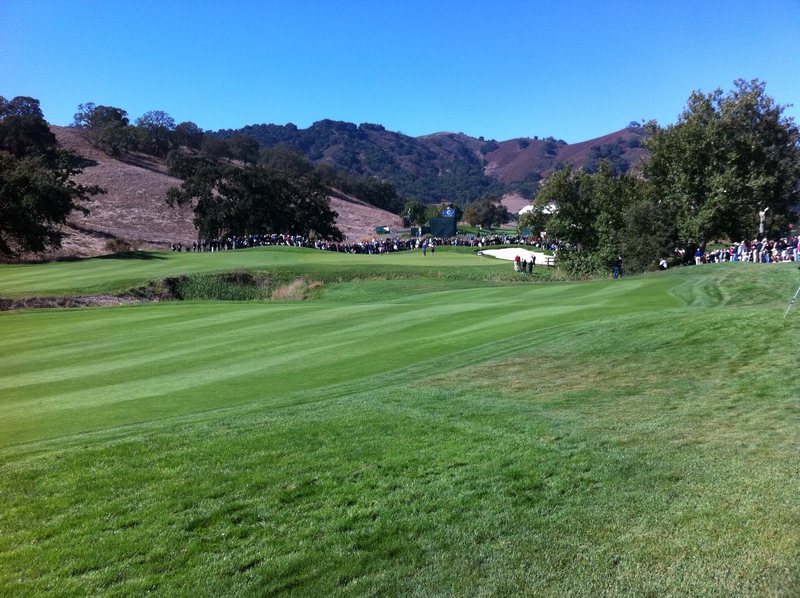 As was my previous experience at the Presidents Cup at Harding Park, spectators are made to park in the next county over and bussed in to a make shift entrance at one end of the course. My suspicion that the fog might delay the start of the tournament was confirmed when, on the driving range, a tournament official announced “2 hours.” Unfortunately, this was later extended to two and a half. I spent a good part of the morning at the driving range watching players warm up and generally screw around due to the fog delay. It was great to see how these guys warm up, but at the same time demoralizing to see how good some of these guys are without even appearing to try. If you get the chance to go to a PGA event, I recommend spending some time watching players at the range. Not only do you get a chance to see them hit more than one shot without having to walk and jockey for position, but you get a better sense for how the pros think through their shots and how they correct for errors. I quickly stopped by the putting green to see if I could pick up some practicing tips, but watching the pros was less than helpful. As I would expect, they aren’t actually practicing at the putting green, for the most part, rather, they are just getting a sense for the speed of the greens. 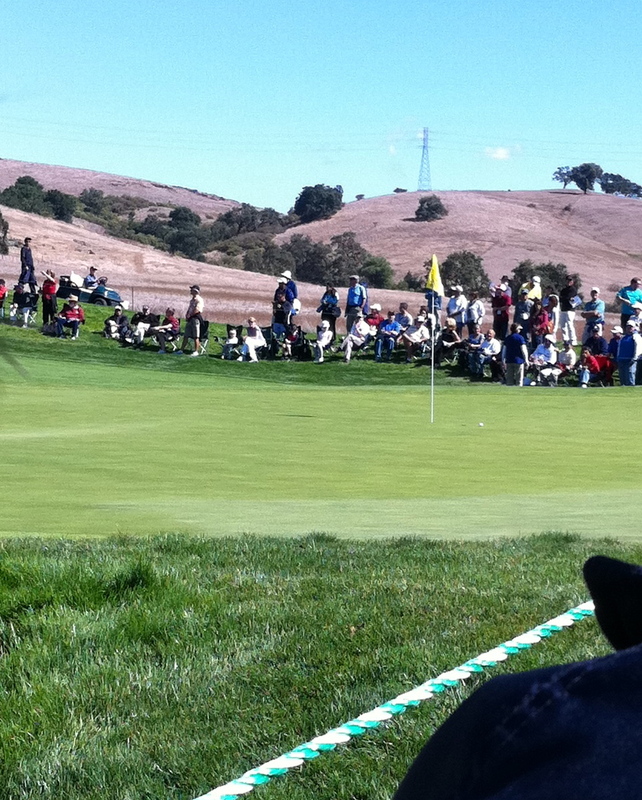 As 10 am crept up, I made my way to the tenth tee to watch Tiger. The gallery had grown to 7 deep by this time. I can honestly say we were herded. I felt that mooing was appropriate. 10: huge drive in the middle of the fairway. 3/4 wedge to 8 feet. Par after the birdie putt burns the edge. 11: 236 yard par 3, stuck to 4 feet. Birdie. 12: drive left, layup short, wedge to 20 feet, birdie putt misses by 2 inches. 3′ 5″ for birdie. The next closest to the pin for the day was over 9 feet. I also had the chance to follow Mitch Lowe who is the subject of a previous review: Review: Lesson with PGA Professional Mitch Lowe and the Fleming Course at Harding Park*. In particular, Mitch made a great birdie on the par-5 9th hole. His playing partners were not able to capitalize on the same opportunity. One found the water short left, the other missed his 20 footer. All in all, the experience was fantastic. I got to check out a course that I would normally not be able to play, skip out on work for a few glorious hours, watch the best players in the world play the game, and meet some nice people. While watching golf on TV gives you a complete picture for the action, being there and seeing it live is clearly the way the game should be taken in. TV, despite the advances in technology, cannot give a true sense for how fast the pros swing the club, the actual ball flight and variation in trajectory, and how much better the pros are at controlling their shots. If you get the chance to support a PGA event, do your best to make it there for at least part of a round. You won’t regret it. *Mitch is now teaching at the Golf Links at Half Moon Bay. I recently had a lesson with him there and found it incredibly helpful, as the previous lesson. 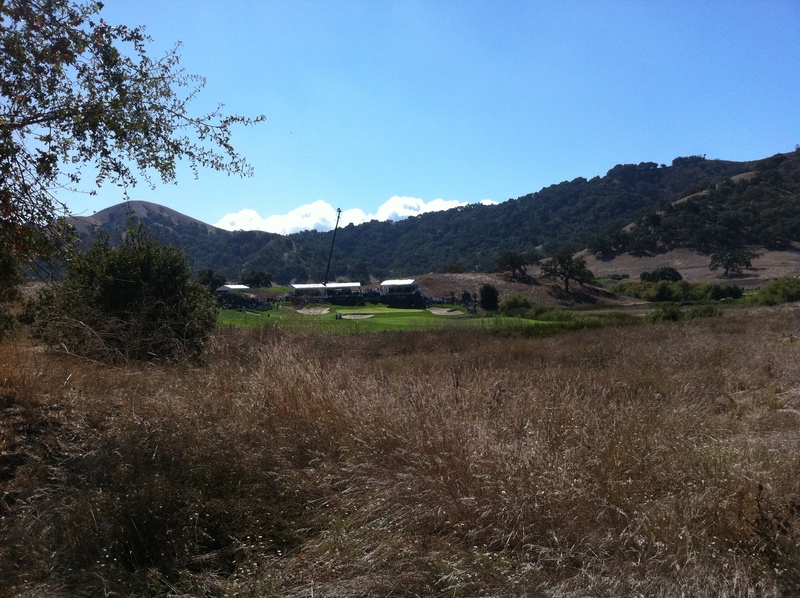 The unique part of lessons at HMB is that there is no driving range, so your lesson is all out on the course. I found this particularly useful for my short game and iron play.